[/caption]The Hubble Space Telescope has detected carbon dioxide on a planet orbiting another star. The star in question is HD 189733 (also known as V452 Vulpeculae, a variable star designation), a binary system over 60 light years away, and the planet is approximately the size of Jupiter (called HD 189733b). The exoplanet is already known to contain water and methane molecules from previous Hubble and Spitzer campaigns, but this is the first time CO2 has been discovered. 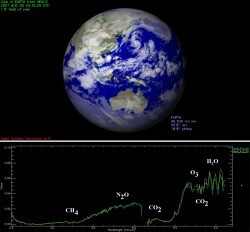 Indeed, it wasn’t only carbon dioxide that was found; carbon monoxide was also detected in the exoplanet’s atmosphere. But the fact that CO2 is a “tracer” for life and it has been detected on a planet other than a planet known to contain life (Earth) is incredibly significant. As time goes on, observation techniques advance, it is hoped small rocky bodies will be observed. If this can be done, an Earth-like planetary survey can be carried out. In fact, ESA’s Venus Express was recently used to characterize what Earth looks like from a distant vantage point, providing astronomers and future extraterrestrial hunters with a model that can be used when observing distant star systems. If a planet, with a similar chemical composition to that of the Earth is discovered, it would become a prime candidate for harbouring alien life. So how did Hubble detect CO2 on HD 189733b? Through a spectroscopic analysis of the infrared radiation being emitted by the hot planet, Hubble’s Near Infrared Camera and Multi-Object Spectrometer (NICMOS) spotted an abundance of CO and CO2. Certain molecules in the exoplanet’s atmosphere absorb certain wavelengths of infrared light, leaving a spectroscopic “fingerprint” in the light detected by Hubble. This kind of campaign is best carried out on star systems with their ecliptic plane seen edge-on to the Earth. This means the orbit of the exoplanet carries it behind the parent star and then infront of it. HD 189733b transits (or eclipses) its parent star every 2.2 days and then orbits behind the star. This is an ideal situation as astronomers are able to measure the emission from the star (when the line of sight to the exoplanet is blocked by the star) and use those measurements to subtract from spectroscopic analysis of the exoplanet. This technique isolates the exoplanet emission making it possible to analyse the chemical composition of its “day-side” atmosphere. “We’re starting to find the molecules and to figure out how many of them there are to see the changes between the day side and the night side,” Swain said. In the right direction for exploration. Nostradamus would be laughing. “We live in times of wonder Simon says” … To Astrofiend … I’m a Trekker and I agree with that statement.Unless there’s some unexpected new discovery we won’t be whizzing to the stars anytime soon. But of course we are, in a way, using Hubble. The significance of these discoveries needs to be constantly reiterated less they are lost in a sea of fuzzy thinking. Anyway, many Trekkers know that show is about our modern way of life. The stardrive is just a convenient story telling device. I suppose my question would be if it is possible to know that the results we’re seeing aren’t representing both the planet and possible moons? Carbon based life, not lifeforms in general. I keep wondering why are we only looking for carbon based lifeforms? Even through earth only harbors carbon based life, that’s only one example- for all we know we are the minority type of lifeforms. Even then what are we going to do if we find life?- Calculate the abundance of life in the universe? What we need is some better resolution so we might be able to pick up more in depth details, like orbiting structures, wartime explosions, mass movement, radiation, something that should result from civilization – a little more important, even if they breath methane and their planet is inhospitable to us, at least then we could interact with them. All that aside we as a whole should concentrate more on becoming space faring, before seeing a place that we can’t even get to. Claytronic also brings up a good point- we should also be looking for a nearby second earth to inhabit. low-g, decreased radiation flux, ready minerals and life-support compounds: the asteroid belt is the place for us until ftl travel. Some people just aren’t happy. Yes, we should be looking for more chemicals and for life markers of lifeforms whose metabolism we know nothing about. We should also forego telescopes and just warp out to these planets and look at them. Better yet, we should hop through a wormhole and just be there. Right now we are doing incredible science with the devices, techniques, and knowledge that we have. Each discovery and each technical advance moves our abilities further out. Someday, we will be able to identify every type of molecule that exists on each asteroid around every star and we will be able to communicate with every form of intelligent life that is out there. Unil then, I am fascinated and thankful for the science being done right now. Just a few years ago, we couldn’t even prove that other stars had planets. Now we are examining atmosheres on exoplanets. Some people are just never happy with anything. Quit carping and enjoy the wonders our scientists are uncovering for us. If you want to learn about what are required for life-forming molecules to form, i recommend you study some Molecular Biology. Carbon based life forms will be the dominant form, because very few, if any, other base can sustain the complexity needed. What you want, may not be the same as i want, or what others want. I hope that you realise you are only speaking for yourself, and definitely not for me. Nice work on the discovery, small step forward, but a step forward. Flaming Pope – we will never, in our lifetime, or the next generations or the two or three after that, be able to harness enough energy to get a manned mission to even the closest stars. The problems involved are simply too great. In fact, I doubt it would be technically possible to have a manned mission travel beyond Mars orbit in our lifetimes without a simply ungodly amount of resources being poured into it, and Mars is over 100,000 times closer than the very nearest star at it’s furthest from the Earth. Unfortunately, perhaps for us, being able to ‘see a place we can’t even get to’ is the best we can ever realistically hope for. I think it nothing short of a miracle that we are able to find out so much about such places without being able to physically visit them. Losing out on such profound discoveries for some Space Trek pipe dream would be simply laughable. Odds are, it is simply a matter of time before we find many Earth-sized planets. When this happens of course, research priorities will undoubtedly shift towards a full-scale assault on studying the atmospheres of such planets, and I think the next generation of space telescopes will be optimised for just that purpose. I would say ‘that’ll be an exciting time in astronomy’, but really when isn’t it an exciting time in astronomy! What about Mars or Venus? both have C02 in abundance. @Jason: That’s what I was thinking, too. Venus in particular. If the search for life outside our own are to be taklen seriously it should definately pay extra attention to similarities with our own planet, including chemistry. One reason may be that all life may be similar to terrestrial ones, but of course this is controversial and may or may not be true. More important: If such a scientific programe should make any sense, one must know what to look for. The alternative could easily be searching “something” or “anything”. A bit vague, is´nt it? I agree absolutely with Marco. The science being done is fantastic and we should celebrate that not continually carp about how fuzzy the images are; how did they forget to put that on the mission; are they hiding something? ; why can’t we see this, that or the other? ; have they considered this? For goodness sake people ten years ago most, if not all, of what we’re seeing was barely imagined. Great article. Suggestion for a future article. It would be great to have a brief synopsis of the history behind planet (and chemical signature) detecting–how it evolved, techniques developed, technology that made it possible, and so forth. It wasn’t so long ago (at least I can remember) when the best thinkers out there were wondering if there even were exoplanets. I think that’s about as close to a modern day renaissance as you can get! Dutch Delight, there’s always a possibility, but I’d say that for this planet (and this planet type), the probability of having moons at all of any significant size is just about zero. That close to the star, the Hill Sphere is so small, even for a big planet and a small star, that the likelyhood of having moons within it wouldn’t be great to start with, and if you add the perturbing effects in the moon’s orbits of having a huge mass so close, in all likelyhood nothing other than possible temporary captures would be orbiting hot jupiters. And, in any case, spectral line strength depends on the quantity the given molecule is present in. And in anything short of a double planet, you’d always get a whole lot more atmosphere in the planet than in its eventual satellites. So it’s safe to assume that most, if not all, of that spectrum comes from the planet itself. Life is extremely complicated – it must carry out all sorts of metobolic processes. Only carbon has a chemistry that is complex enough to support living systems. No other element comes even close. Therefore both CO2 and methane (CH4) can be considered markers for the possibility of life. Both are commonplace throughout the solar system and universe as a whole. So .. how long till we get a decent hi res piccy of one of these planets ? seeing some blue somewhere else would be even more mind blowing ! I’ve got nothing against Trekkers or anything… I enjoy an episode from time to time. I simply used it as a convenient example of the type of spacefaring that is so far beyond anything we’re currently capable of that investigation through science is literally the only way we may come to learn about these far away places. It was simply the counterpoint to Flaming Pope’s view as I understood it. Don’t get me wrong though – I think humanity has a fighting chance of one day becoming spacefaring in that sense, but we’d be talking at least hundreds of years even before manned missions beyond the Earth-Moon system become somewhat commonplace. When we get bigger, badder (and almost certainly space-based) telescopes. Simple as that. We’re operating right on the edge of what’s currently possible, as it is. span is limited under the current technological posibilities! Untill we are able to travel at light speeds, we have the human factor as a limitation!